This city is a pretty big deal. At least that's what authors, musicians, artists, and historians have been saying for thousands of years. And of course we totally agree! It's a breathing museum, frozen in time, and home to some of the most famous architecture and life-changing gelato. As they say, "All roads lead to Rome". So if you haven't been there yet, it absolutely needs to be on your ultimate bucketlist! Along with our other favorite Italian cities. After visiting Rome, you'll understand why this "Eternal City" is still called "the capital of the world". There is no where else quite like it. 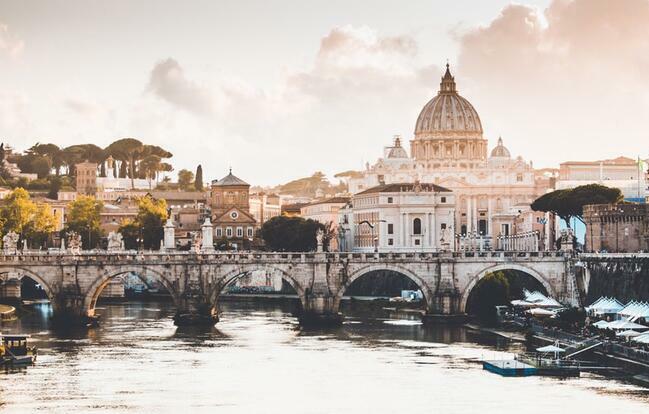 Make sure you check out our list of the do's and don'ts of Rome in order to make your trip the very best possible! Maybe the only problem with Rome is that there is so much to do! But if you plan things well, you can pretty much see all of the best things in just a couple of days. Want to know how to make the most of your visit? We've put together this guide to help you plan the perfect getaway that is what all our dreams are made of! Obviously there are a lot of places you can listen, watch, and read about the history of Rome, so we won't get too much into it. Here's just one fun fact about how it all began. Although there's been evidence uncovered in the past 5 years showing there were people living in this area 14,000 years ago, tradition says this city was founded in April of 753 BC by twin brothers, Romulus and Remus. After a squabble, Romulus killed his brother and named the city after himself. This is the site for the rise and subsequent fall of one of the greatest empires the world has ever seen. There are two international airports that service Rome, the Leonardo da Vinci Airport (also called the Fiumicino Airport) or Ciampino Airport. The best/cheapest airlines to fly with are Ryanair, Easyjet, Wizzair, and Vueling. Check them all and you may be able to find tickets for about $60! From Fiumicino Airport: To get downtown, jump on the Leonardo Express train that takes you to the Roma Termini Station in 30 minutes. It's about $16 each way, but it's the fastest way to get to the heart of Rome, and it runs from 7 am to 11:30 pm daily. You can also catch a Terravision shuttle bus that leaves from the airport’s terminal 3 and will take you to a stop near the Termini station in 55 minutes. It costs about $6 there and $13 back. The buses leave the airport from 5:35 am to 11 pm daily. From Ciampino Airport: The best way to get to the city center from this airport is to catch a Terravision shuttle bus to the Roma Termini station. It only takes 40 minutes, with the buses leaving the airport from 8:15 am to 12:15 am (midnight) daily. The ticket is about $7 each way. You can also hire a taxi, since they have a fixed rate of about $35 for getting you to the city center and can accommodate 4 passengers with their luggage. Just double check with the driver before you get in. If you're coming from any other city in Italy, this is the way to do it. A lot of times it's actually cheaper to fly straight to Milan or Florence and spend a day there before catching a train to Rome. In a high-speed train you can get to Rome from Florence in 1 1/2 hours and from Milan in 3 hours. 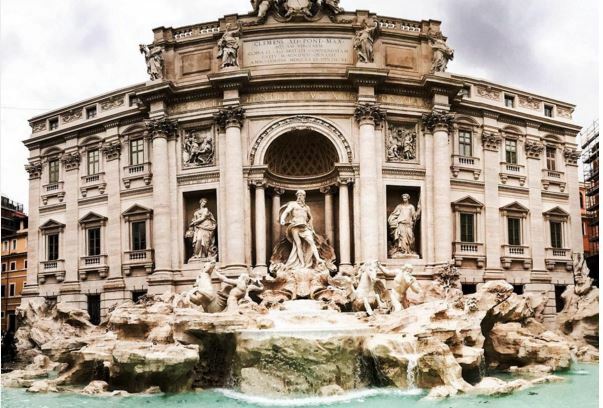 The Roma Termini Station is the one you will be arriving at (if you're coming from either airport as well), which is only a 30-minute walk from the Trevi Fountain. This is a great connecting point since both the A and B metro lines stop here, as do several buses. Visit Omio.com to purchase your tickets in advance. Also check out this really good guide for traveling around Italy by train! As with most old, beautiful cities, our first piece of advice is to walk...walk a lot! But if you need to use public transportation, Rome has got some pretty good options. You've got the metro (which only has lines A and B), buses, trams, and taxis! And you can purchase tickets that will last for 24 hours, 3 days, or even 7 days. Here's a very detailed post all about transportation in Rome! So first things first, you have to choose which neighborhood you want to stay in, because each offers a unique experience. Here is a blog post that will tell you the pros and cons of each! 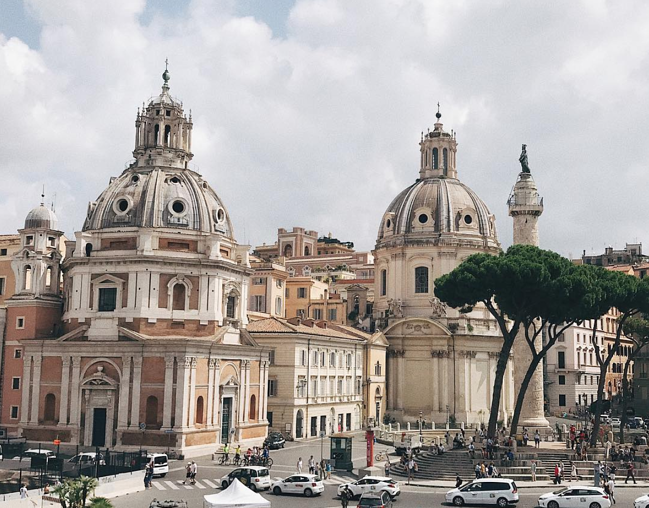 If it's your first time in Rome, we recommend Centro Storico, the Historic Center, so you can be in the heart of it all. Of course that means everything will be a little pricier, so just do some looking around. La Controra: A lot of the hostels in Rome are all about the nightlife, but this one is a little more quiet, secluded, and peaceful. Really the perfect spot to get a great night's sleep after a packed day. It's about a 10-minute walk from the Trevi Fountain, and is close to many restaurants and cafes. Free wifi, towels, and breakfast makes it a win, win, win! Book your stay here! Generator: This one is just a 5-minute walk from the Colosseum and one of the highest rated hostels in the whole city! It's across the street from the a food market, so easy/cheap meals consisting of fresh Italian produce. It also has free wifi. Book your stay here! If you haven't noticed from some of our other city guides, we are big fans of Airbnbs. If you're going with a group, it usually ends up being cheaper. Plus you get to stay in the home of a local and feel like you're getting an authentic experience! So many pros to finding a cutie house. Check out this one that's located right by the Spanish Steps and not far from the Trevi Fountain. Only $91 per night and works great to split the costs with your group as it can house up to 4 guests. It looks so elegant! 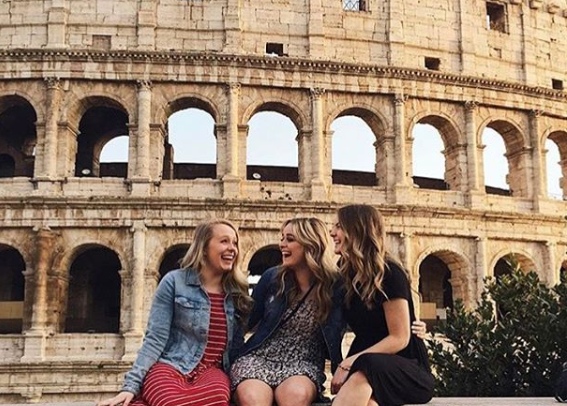 Wanting to stay by the Colosseum? This is the one for you! Also totally beautiful, with 2 bedrooms for only $82 per night! 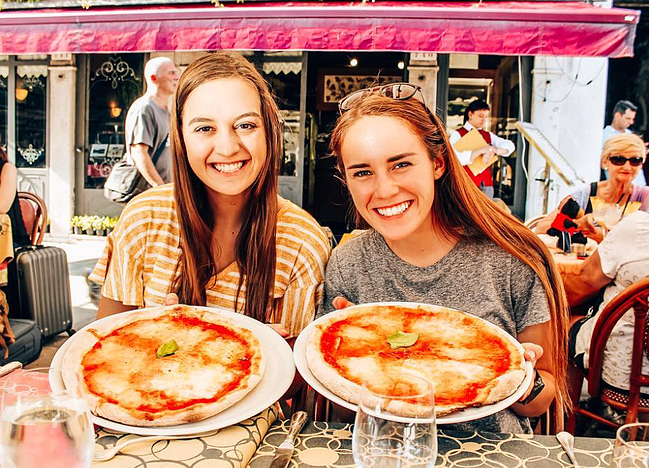 When in Rome, you must eat like the Romans do. Here are several savory things we love and absolutely recommend trying. Insalata caprese: Mozzarella cheese with tomato. Make sure you add some fresh basil too for the ideal combo of flavors. Frutti di mare: Literally "fruit of the sea". Bring on all the shellfish. Risotto: Rice cooked in broth with a variety of spices and other ingredients. Gnocchi: Soft dumplings made from potatoes. We're big fans of mixing these with pesto sauce. Pizza: You'd better not need an explanation for this. Eat all the kinds for breakfast, lunch, and dinner. You'll probably be able to eat an entire one by yourself because it's not as heavy as the variety we make in the USA. Can't forget about that sweet tooth. Here are a few of our favs, but don't be afraid to branch out; surprise treats are the best sweets. Tiramsu: This is the OG of Italian desserts; the classic. Made up of cookies soaked in coffee, marscarpone cheese, and cocoa powder, it will leave you with a little caffeine kick. So while you're YOLOing in Rome, top off your trip with this treat that literally translates to "life me up". Profiteroles: Cream puffs. Feather-light pastry and sweet cream filling included. They actually originated in Italy (not France), and the best kind are the ones drizzled with chocolate ganache. Cannoli: Ever heard the phrase, "rolling like a cannoli"? Us either. But once you've eaten a whole pizza, three gelato cones, and a few of these crispy tube-shaped pastries filled with cream and topped with powdered sugar all in one afternoon, you'll be saying it. 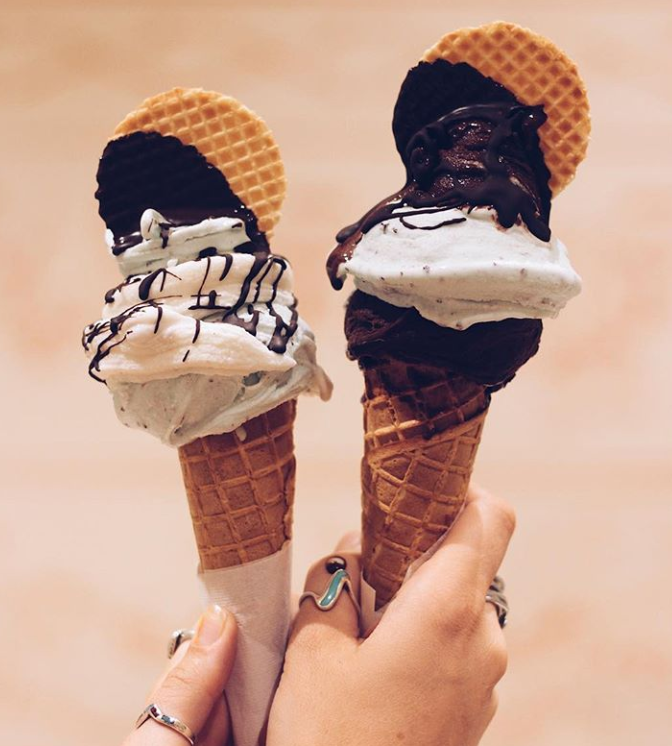 Gelato: If you really want the full experience, you've got to visit this place and try all 150 flavors of gelato! Okay, the might be a little overkill, but at least try several...a day. Can't get to that location? No worries since there's a gelaterie on almost every corner. 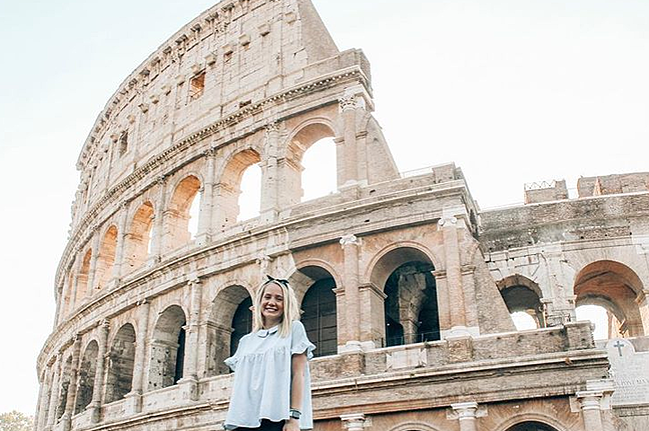 No matter what you end up doing in Rome, look into free tour options, like these ones, instead of booking one of the expensive touristy ones. These beautiful 138 steps have been here since 1723 and are known for being the widest steps in Europe. 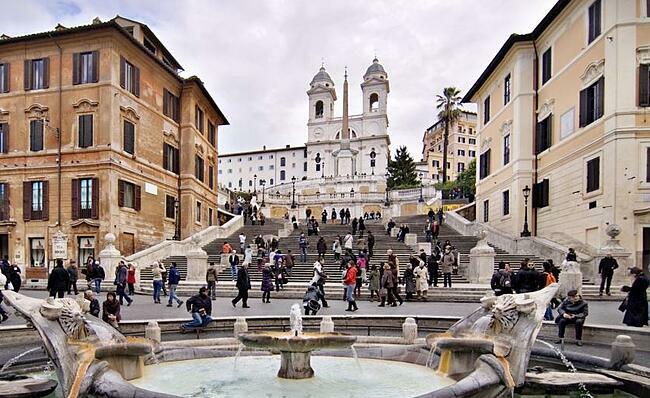 We recommend making the Spanish Steps your first stop in the morning, between 7-9 am, to beat the crowds. They have attracted many artists, painters and poets throughout the years. In fact, English poet John Keats' home is nearby — it's now a museum on the corner to the right of the steps and admission is about $7. This must-see is only a 10-minute walk from the Spanish Steps and at the heart of the city center. When making a wish, use your right hand to throw a coin over your left shoulder and then all of your dreams are sure to come true. Have you seen "When In Rome"? Then you know it's best to leave the other coins in the fountain right where they are. Almost $2,500 are thrown into the fountain every week. The coins are then collected at night and used to subsidize a supermarket for the poor. So your money is going to a really good cause! This ancient domed building is another sight that you cannot miss, especially because admission is free! The only source of light inside comes from a large hole at the top of the dome. The Pantheon is almost 2000 years old and the final resting place for several famous Italians, including the artist Raphael. It still functions as a church and is a popular spot for weddings. Plan on spending about 20 minutes inside. After admiring the Pantheon, start to head towards the famous Colosseum. On the way, you'll run into a monument—a huge building made entirely of white marble. The focal point is a statue of a horseman, a representation of the first king of Italy, Victor Emanuel II, whose goal it was to create a unified Italy. This monument also includes the "Altar of the Fatherland"—the tomb of an unknown soldier killed during World War I. It has become a respected symbol for all of the unknown Italian soldiers killed in battle. Hours: Daily from 9 am to 7 pm. This was the center for all religious and public life during the days of ancient Rome, including the main market and government buildings. You can still see the ruins of many temples built for the Roman gods, and the Arch of Titus that was built in celebration of the Roman's victory over Jerusalem. 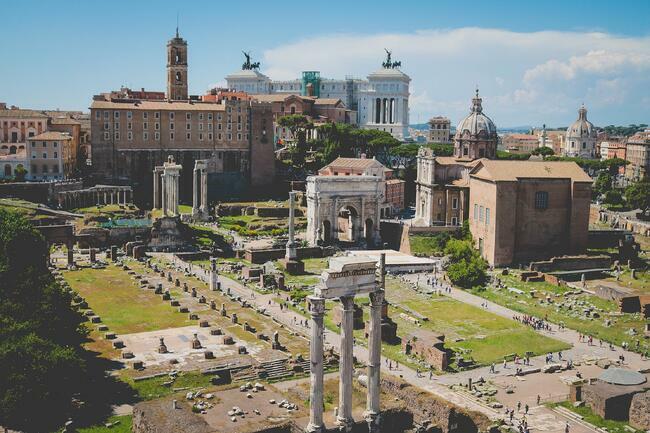 Tickets are required and we recommend grabbing the one from this official site that includes your visit to the Forum, the Colosseum, and Palatine Hill. It's only about $14 and well worth it. And unfortunately you don't qualify for the student ticket since they are only for those studying in the European Union. Remember the brothers, Romulus and Remus, that we mentioned earlier? Well one part of the story we didn't mention is that myth says they were raised by a she-wolf. Yep, just like in the Jungle Book. Legend says this hill is where Mama Wolf lived with her man cubs. Today the hill is covered in gardens, ruins of what were once the huge homes of nobility, and a museum. Definitely a great stop if you're interested in Rome's history. Hours: Daily from 8:30 am to 7 pm. As soon as you see it, you'll understand why this HUGE amphitheater is considered the symbol of Rome and one of the World Wonders. It was used for gladiatorial contests, animal hunts, public spectacles, executions, re-enactments of famous battles, and dramas based on classical mythology for over 500 years. This is definitely a must-see! And the best place in Rome to get that iconic Instagram photo. As a reminder you have to book your tickets to the Colosseum in advance — don't expect to just show up the day of and waltz right in. Visit this site to get the best tickets for your group. Hours: Daily from 8:30 am to one hour before sunset. The Church of Jesus Christ of Latter-day Saints will dedicate their first temple in Italy in March 2019. If you're temple hopping through Europe then this absolutely needs to be one of your stops! Read this brief history of the Rome temple to know a little bit about everything that went into making this construction possible. This is actually the smallest state in Europe, and it's located within Rome. 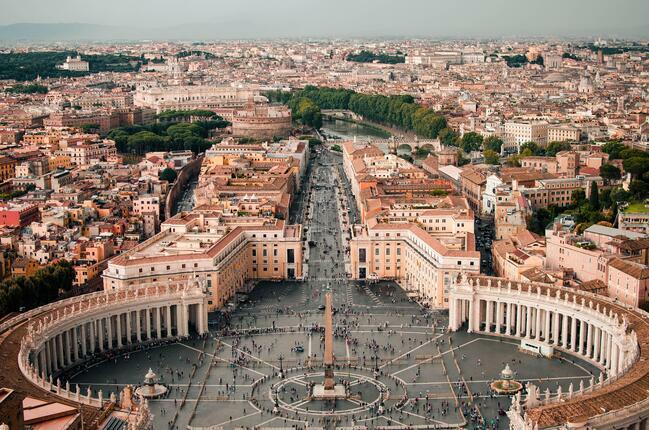 Ruled by the Pope, it has only about 1000 inhabitants and is the headquarters for the Roman Catholic Church. The earlier in the morning you can get to the Vatican, the better! This is one of the biggest churches in the world and is named after Christ's apostle, Peter. 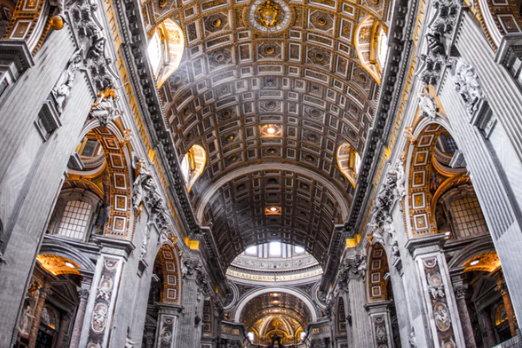 The design for the dome was started by Michelangelo and something well worth the effort is to hike up the stairs (up and up and up all 551) all the way to the top of the dome. The fee is only about $6 and at the top you'll get some unbelievable views of the Vatican and Rome. Admission for the rest of the Basilica is free. Hours: Daily from 7 am to 6:30 pm. St. Peter's Square: At the feet of the basilica is one of the most breathtaking squares in the world (although this one is more of a circular shape). There are 284 pillars around the square and 140 statues of saints. At the center is a giant obelisk from Egypt and two fountains. Sistine Chapel: As the home for Michelangelo's masterpiece, "The Creation of Adam", this chapel is known for the stunning and colorful frescoes that cover the walls and ceilings. It is also the place where popes are chosen and crowned. Tickets are about $18. Hours: Daily from 9 am to 6 pm (but the ticket office closes at 4 pm). It is also closed on a few random dates during the year, so just make sure it is open on the day you are planning to go. 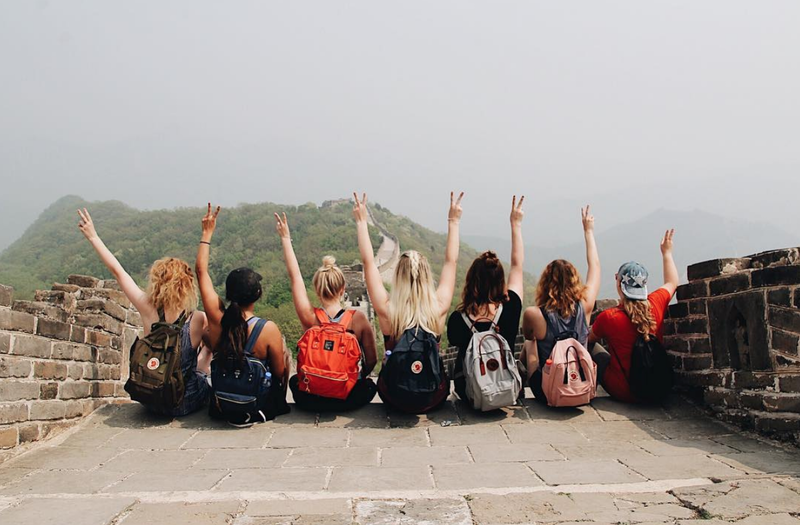 Ready to spend a semester volunteering in Europe? We're here to help you through the entire application process. Click the button below to get started on this new adventure!